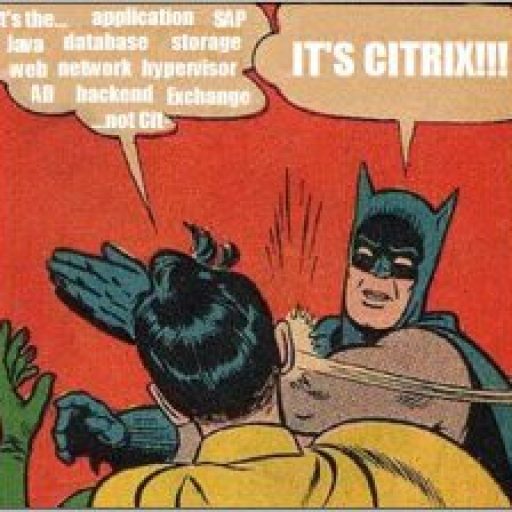 Looks like the Citrix marketing department is ramping up. Check out these webinars if you have time. Subjects cover Provisioning Services, Server and Desktop Virtualization, and Netscaler. Training is always the first cut made to budgets so take advantage. In this session, we’ll discuss Best Practices for Simplifying Implementation of Provisioning Services using new features of Provisioning Services 5.1. Learn how to provide maximum availability, automatic disaster recovery and secure remote access to your Citrix XenApp™ environment with the seamless addition of Citrix® NetScaler™ and Citrix XenServer™. If you are seeking to learn more about the most effective way of delivering Windows applications as a service then you don’t want to miss this. Join us as we chat about what makes XenApp a logical choice for application management and virtualization. You will learn about functionality that enables you to centrally manage a single instance of each application and deliver it to users for online and offline use, while providing a better than installed user experience. Attend this webinar and get the answers and insight you need about purchasing or upgrading to XenApp 5.0. Grab your coffee and be part of the discussion! If you are seeking to learn more about advanced application delivery controllers that improve upon Load balancing and help ensure application availability, increased security, and reduced TCO for web application delivery and cloud computing environments, then you don’t want to miss this. Attend this webinar and get the answers and insight you need about network load balancing technologies. Grab your coffee and be part of the discussion! Don’t let your basic load balancer hold back your network infrastructure any longer. Join us for this webinar and find out how you can get a smarter, more efficient application delivery network to ensure app availability, increase security and reduce TCO for web applications and cloud computing environments. Learn how Citrix® NetScaler® delivers more applications to more users including advanced Web 2.0 apps without increasing network & server costs. Join us for this Webinar and hear firsthand from experts at Citrix and CSC how you can cost-effectively implement a more secure and accessible enterprise desktop environment for your workforce. Find out how Citrix and CSC have joined together to deliver desktop virtualization as a managed service to their clients. Also, learn how this technology has transformed the operations of both commercial and public sector enterprises and provided quantifiable business value. Recently, Guy M Turner, Inc. consolidated their IT infrastructure with XenServer and NetApp and added disaster recovery for servers running everything from specialized trucking to crane management applications. Join us for a live Webcast to learn how they used NetApp with Citrix XenServer and XenApp to address their challenges. “Once organizations have determined to implement a virtual desktop solution, and the environment has been designed to align with business and user requirements, users must be seamlessly migrated from their physical endpoints to their new virtual desktop. Ideally, users should be unaware their desktop is now virtual. Without building a proper environment and migration plan, users will be forced to learn a new system, reconfigure their application settings, and re-build their personal environment. “When an organization identifies the need for a VDI solution, infrastructure architecture must be carefully designed. Virtualizing a user’s physical desktop and migrating the image into the data center will provide a VDI solution, but requires different management, maintenance, and support from a local desktop to meet the needs of the users. “Everyone uses a desktop device, regardless if they are running virtualized applications on XenApp, web-based applications or locally installed applications. While virtual desktops are all the rage in IT, many organizations are trying to figure out where VDI fits within their infrastructure. Some organizations are following an all-or-nothing route where every user is converted to a virtual desktops but many others are trying to align the VDI solution to specific user requirements. When does a user need a full-blown virtual desktop vs. a desktop appliance vs. an offline desktop? Do you have questions about the best way to rapidly and efficiently deploy virtual desktops; how to handle VDI boot storms; or how to meet demanding recovery requirements necessary to make desktops continuously available? Get answers in real time and watch a brief VDI demo. Join us for a live online Q&A/chat session with a panel of NetApp and Citrix experts who can answer basic and expert-level questions. You’ll have the opportunity to ask specific questions, as well as see the answers to questions asked by your peers. Furthermore, Citrix are also going on the road and hosting FREE seminars throughout the USA.. I have listed a few of them here.. please visit and see if the Citrix Seminar Roadshow is coming to a town near you! Devon IT sells thin clients so we have a close relationship with Citrix… so I don’t mean to be rude, but I’d the choice of “No” and “Yes” for the last question please. I totally agree. That was pretty sneaky of Citrix. Then again, it’s a down economy and sales people will do what they can to generate business.